Blarney Castle (Irish: Caisleán na Blarnan) is a medieval stronghold in Blarney, near Cork, Ireland, and the River Martin. Though earlier fortifications were built on the same spot, the current keep was built by the MacCarthy of Muskerry dynasty, a cadet branch of the Kings of Desmond, and dates from 1446. The Blarney Stone is among the machicolations of the castle. The castle originally dates from before 1200, when a timber house was believed to have been built on the site, although no evidence remains of this. Around 1210 this was replaced by a stone fortification. It was destroyed in 1446, but subsequently rebuilt by Cormac Laidir MacCarthy, Lord of Muscry, who also built castles at Kilcrea and Carrignamuck. The castle was besieged during the Irish Confederate Wars and was seized in 1646 by Parliamentarian forces under Lord Broghill. However, after the Restoration the castle was restored to Donough MacCarty, who was made 1st Earl of Clancarty. 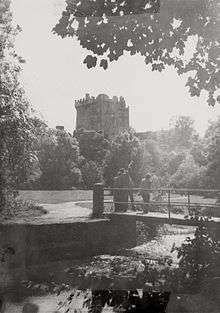 During the Williamite War in Ireland in the 1690s, the then 4th Earl of Clancarty (also named Donough MacCarty) was captured and his lands (including Blarney Castle) were confiscated by the Williamites. The castle was sold and changed hands a number of times — Sir Richard Pyne, the Lord Chief Justice of Ireland, owned it briefly — before being purchased in the early 1700s by Sir James St John Jefferyes, then governor of Cork City. Members of the Jefferyes family would later build a mansion near the keep. This house was destroyed by fire, and in 1874 a replacement baronial mansion, known as Blarney House, was built overlooking the nearby lake. In the mid 19th century the Jefferyes and Colthurst families were joined by marriage, and the Colthurst family still occupy the demesne. In May 2008, the present estate owner, Sir Charles St John Colthurst, Baronet, succeeded in a court action to eject a man who had lived on his land for 44 years. The man's great-grandfather had been the first to occupy the estate cottage. The castle is now a partial ruin with some accessible rooms and battlements. At the top of the castle lies the Stone of Eloquence, better known as the Blarney Stone. Tourists visiting Blarney Castle may hang upside-down over a sheer drop to kiss the stone, which is said to give the gift of eloquence. There are many versions of the origin of the stone, including a claim that it was the Lia Fáil — a numinous stone upon which Irish kings were crowned. ↑ Samuel, Mark; Hamlyn, Kate (2007). Blarney Castle: Its History, Development and Purpose. Cork University. ISBN 978-1-85918-411-0. 1 2 BlarneyCastle.ie – History Archived 11 June 2009 at the Wayback Machine. ↑ Inscription on machicolation reads "Cormac Macarthy fortis me fieri facit AD 1446"
↑ Westropp, Thomas Johnson. "The Monastery of St. Brigid, Kilcrea, and the Castle of the MacCarthys". Journal of the Cork Historical and Archaeological Society. The Society, 1908: 220. ↑ Adams, C. L. (1906). 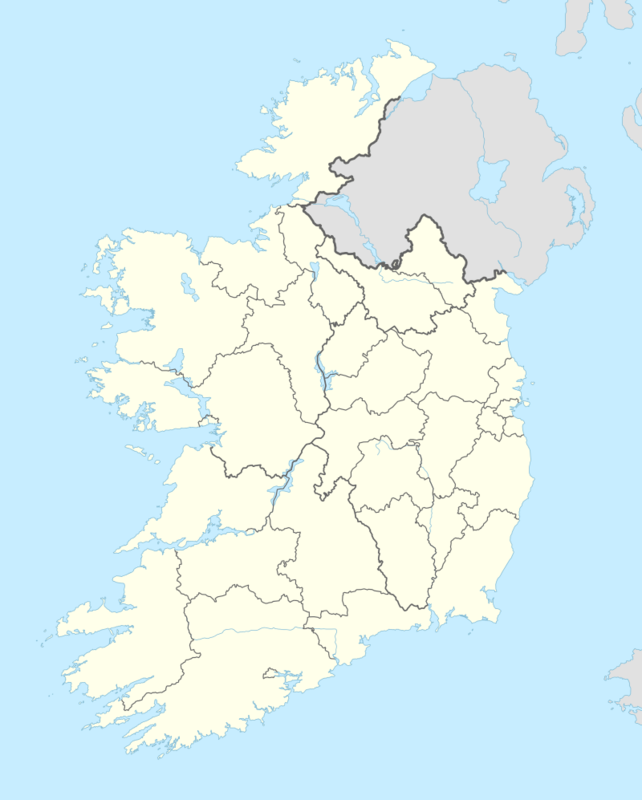 Castles of Ireland: Some Fortress Histories and Legends. Fredonia. ISBN 1-4101-0300-5. 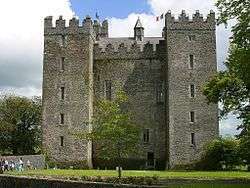 ↑ BlarneyCastle.ie – Blarney House Archived 9 June 2009 at the Wayback Machine. ↑ Irish Times, retrieved 12 February 2012. Wikimedia Commons has media related to Blarney Castle.